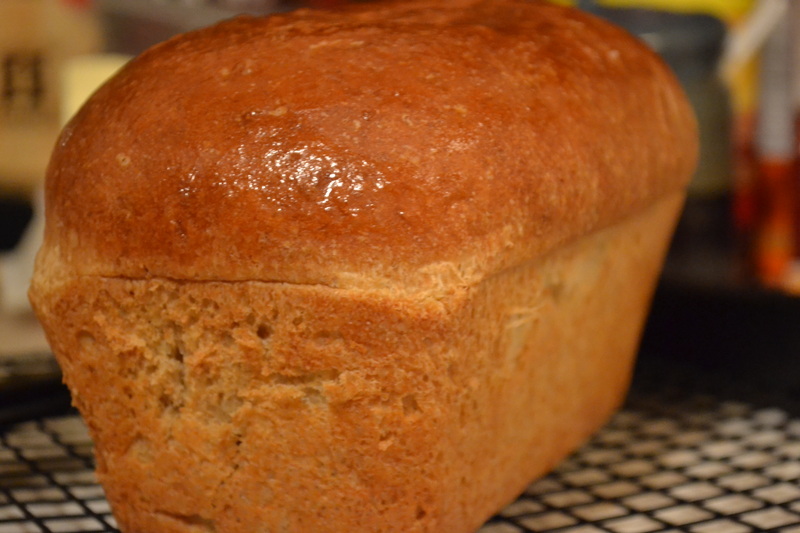 Whole Wheat Sandwich loaf – its perfectly the edible homemade bread I have ever baked…. could have been a bit more sweet, but this is awesome in lot of other ways… soft as a teddy bear, it turned out soo soft that its difficult to cut a perfect slice, you can just pinch out a piece of it, brush some jelly over it, and take a sweet bite. Typically, a whole wheat bread takes about 4 hours from start to finish whether you are using a bread machine or an oven. Well, this one took a bit longer, and because I left it to sit for a few hours after step 1. Should we call this a sponge? Step 1) Mix 1 cup of white bread flour + 1/2 cup of whole wheat flour + 1 packet yeast + 2 tbps of sugar + 1.5 cups of water and mix well, and let it sit for 1 to 3 hrs. Actually, I left mine about 8 hours. When you uncover this, you will see a bubbly frothy mixture, mix it gently. Mine has enough water and hence I didnot add any extra water for the next step. 2) Add 1 egg + 1/3 cup of brown sugar + 1/2 tsp of salt + 3 tbps of oil + 1 cup of whole wheat flour + 1 cup of white flour + 1/4 cup of vital wheat gluten and mix everything together until dough does not stick to the sides of the bowl. 3) After this point, start kneading for at least 10 -15 minutes. During the kneading, if you need to add more flour, add in amounts of 2-3 tbps at a time and slowly incorporate into the dough. I alternated between wheat and white flour. 4) Let it rise for 60 minutes, you will see the dough doubled. Punch down gently and divide the dough into half, shape it into a loaf, and place in the loaf pans. 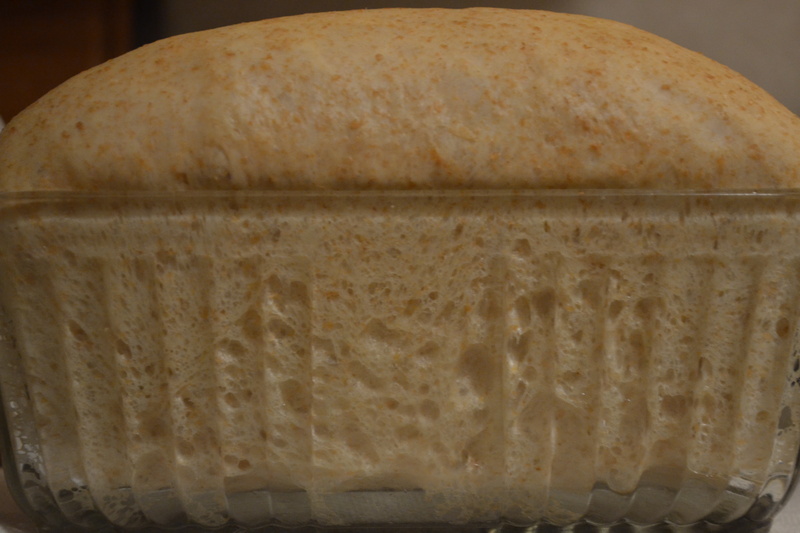 5) Let it rise for about 60-90 minutes for the second rise, until the loaf reaches the top of the loaf pan or when you push with a finger, the dough springs back quickly. 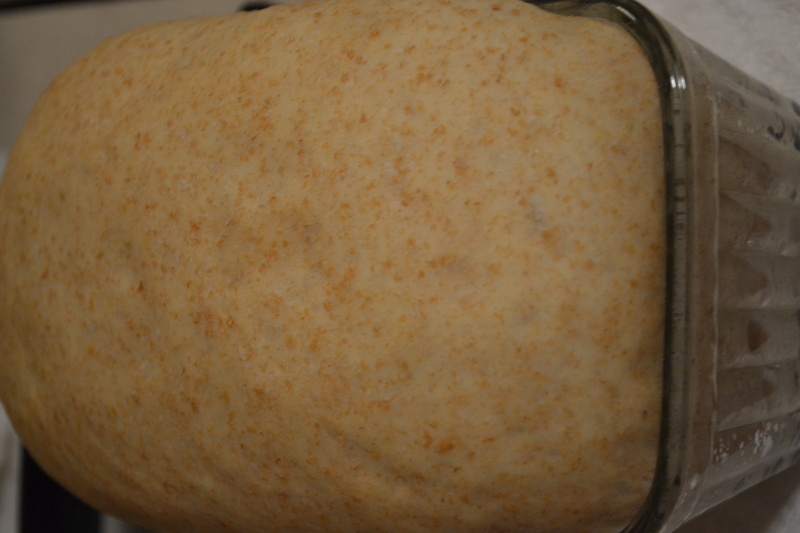 If the dough does not spring back, then it is ready for baking. Mine almost tripled in quantity and was about 1 inch high from the pan. 6) Preheat the oven to 350 and bake for 30-35 minutes. 7) If you prefer a softer crust, just brush a few strands of butter over it and let it cool completely before slicing. Enjoy it with PB & J….